But candidates need to be careful. 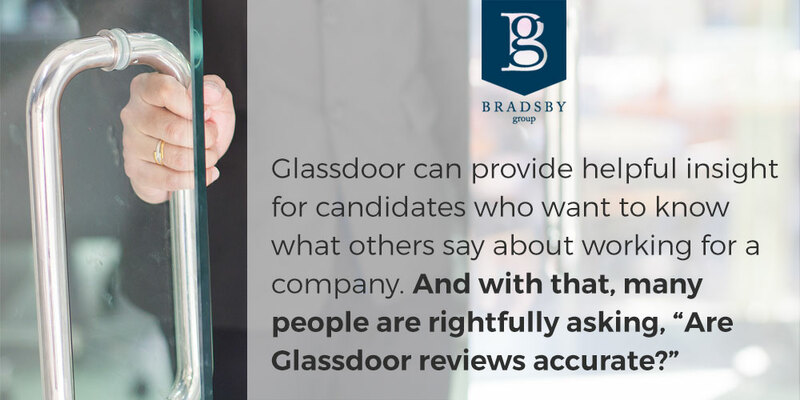 Wall Street Journal ran an article in January 2019 reporting on how employers skew their Glassdoor ratings by incentivizing or pressuring employees to post positive reviews. This practice isn’t limited to just a few nefarious players either, according to article authors Rolfe Winkler and Andrea Fuller. Their article features online mortgage broker Guaranteed Rate, but also found the practice at Amazon, Airbnb, SpaceX, SAP, Slack, LinkedIn, Anthem, Clorox, and Brown-Forman, the corporation that makes Jack Daniels whiskey. Even consultancy Bain & Company does it, and they are Glassdoor’s top-ranked best place to work. Fuller and Winkler document that getting on that list of best places to work appears to be the motivation for many companies to inflate their Glassdoor reviews. Glassdoor has guidelines for employer reviews in an attempt to keep them authentic. Any one employee is allowed to post a maximum of one review per year, per employer. Companies are held to a similar standard. Glassdoor says its filters and algorithms will detect when companies are trying to get around the regulations. If Glassdoor’s Content Moderation Team spots violations by individuals or companies, they will take down all reviews from that source. They also encourage users to monitor reviews they interact with and flag suspected abusers. Should reviews on Glassdoor and elsewhere be trusted? Yes, if we’re wise. In an article for Inc., HR writer Suzanne Lucas has shared some tips. Watch for clusters of reviews, all posted during the same week, same month, or even the same day, especially if they are all positive. This could signal a campaign by an employer to have existing employees post to boost their profile. Watch for polarized reviews. We can expect one or two individuals to have extreme experiences, whether positive or negative. But if most posts about a company are that way, it’s a red flag. Watch for posts that sound fake. A sure sign of a company-generated slant is for a bunch of reviews to sound like the writers were given the same talking points. Also, generalities tend to be less trustworthy than specifics. When you read something in a review that raises questions, ask the interviewer about it. Tell them what you saw and ask them to give their perspective. When you have a job offer, ask to meet some of your future coworkers. They’ll be able to give you a better feel for what it’s like to work there than an online reviewer. Our advice is to not limit yourself to browsing Glassdoor when you’re looking to make a career change. Treat it as a source of preliminary information. Then get in touch with an experienced executive recruiter – a recruiter like Bradsby Group – and enlist their help finding a legitimately great organization where your skills can flourish in an authentically positive culture. Call our team today to get started.